One day we’ll get to my first car, a 1976 Oldsmobile Cutlass Salon with T tops, A 350 V8 with a 4 barrel carburetor and rusted out floorboards. 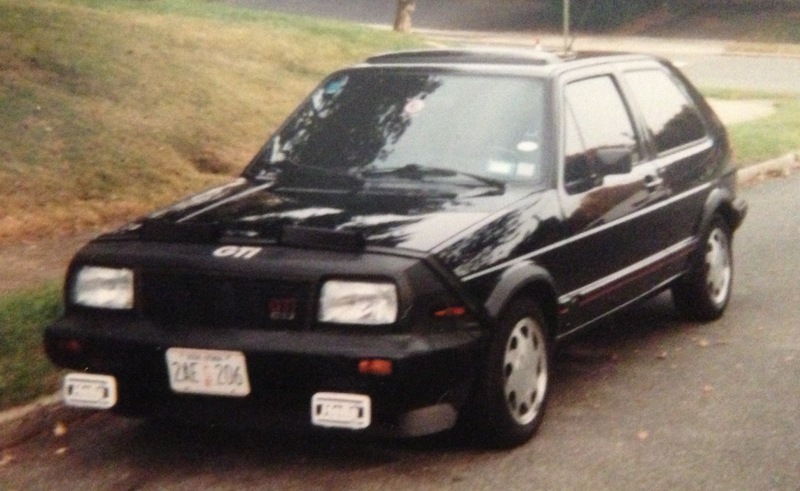 The car in the picture was my first real performance car, a 1987 and a 1/2 Volkswagen GTI 16 valve. They created a half-year model for the 16 valve. I wanted one after spending time in my friend Heath’s 1985 GTI. Mine was a little more luxurious and faster but his was tighter. This was because my car was dissembled by the police before I owned it. During the summers when college was out, I worked at PS Honda in Manhasset. My boss, a very nice older German gentleman named Willy offered to help me buy the car I wanted at an auction. My instructions to him were to buy a car less than four years old, it needed to have a manual transmission and it could be either a Volkswagen GTI or a Honda Prelude. For $3000 he bought a one-year-old loaded GTI with only 1000 miles on it. Of course it belonged to a drug dealer before so the police took it apart and then sort of put it back together again. It took me and a few Volkswagen dealerships another few years to tighten everything up. And despite my friends searches, nothing was ever found in the car. I will save the coyote story for when I am passing through Odessa Texas, where you nearly killed us. But we both learned an important lesson. If an animal smaller than a deer is in front of your car, you just hit it, you do not swerve. Wow, memory lane is looking GOOD !!! Mica blue. Photo is dark. I had an ’86 VW rabbit Wolfsburg Edition back in college – loved that car!